The Musee Picasso was built on the foundation of the ancient Greek city of Antipolis. The museum is home to a massive collection of creative work art and design from the renowned artist Picasso and various other famous artists. Some of the wall posters display detailed information with intricate art work. Musee Picasso is a much recommended gallery for art lovers. How popular is Musee Picasso? People normally club together Rue D Antibes and Cours Saleya Flower Market while planning their visit to Musee Picasso. This review is for the museum itself, not Picasso's work. I don't think I'll understand his work ever. It's good, I just don't know. The museum was wonderful. Staff was helpful and nice. The layout worked pretty well and there was a lot more to see than I thought there would be. There is also an area on top where you can get a great view of the Sea. I can see why this place inspired such great artists. This is a serious gallery, so only worth visiting if you want to learn stuff. Take advantage of multi-entry with the ticket, and especially the adjacent archaeological museum and it's hypocaust. Get back down the hill and the military museum, also included, is fantastic. Please remember this museum is also a war memorial and that Napoleon is a respected historical figure here. If you walk there from the centre, be prepared for a long climb. For those visiting using the French Riviera Pass, it is required to have the same verified before the Tourism Office before being used in the Musee. It was good that the staff allowed us to go inside because we have babies. Limited Picasso artwork. Personally, I think it's a MUST SEE when travelling in Antibes, and even when travelling in Nice. The chronological order of the paintings create a suspenseful story, that left my NOT SO FOND OF ART wife thrilled and interested in art even after the visit. Can't say too much from a professional artistic level, so as a regular human being, I enjoyed it very much. Good collection of Picasso works. Need to be an artist to really appreciate it and I was not one of those. 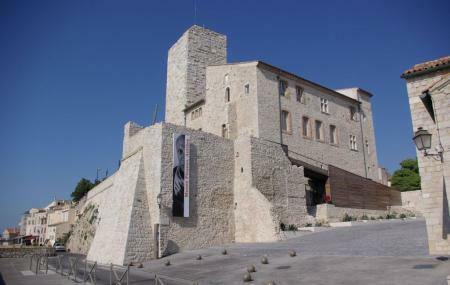 Musee Picasso is open from Tuesday to Sunday between 10:00 AM to 1:00 PM and 2:00 PM to 6:00 PM. Note that the ticket counter closes at 12:30 PM and then at 5:30 PM. There was some work going on at the museum a few days back, but I am not sure about its current status. I think it would be better for you to call them on 33 4 92 90 54 28 directly. I am not sure if you can buy tickets in advance, but as far as I know, it is not necessary to book tickets before visiting. You can directly purchase the tickets from the counter easily.